Image(525), originally uploaded by zbr. Image(528), originally uploaded by zbr. 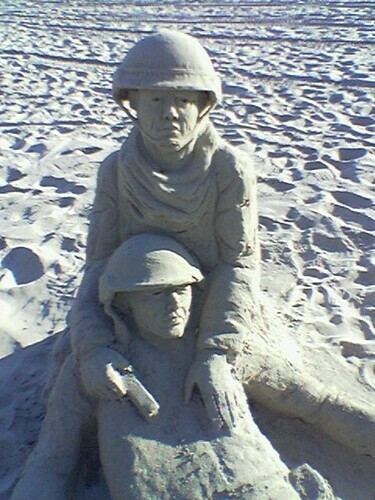 There is this guy up in Santa Barbara who does these amazing sand sculptures. I was up there this day with my now wife Rachel for her birthday. We walked all over State St. and eventually got to the pier to eat lunch and wandered past this amazing sight. 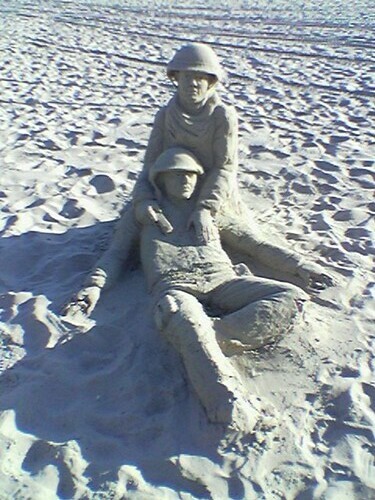 This was to human scale and was and amazingly realistic there was also a message in the sand on a plaque he made. Ah never heart forget, for this our youngest, best and bravest died. There is also this guy who carves wood and then uses a magnifying glass to burn designs onto different wooden objects. I bought a box for rachel if I find a pic I will post it soon.